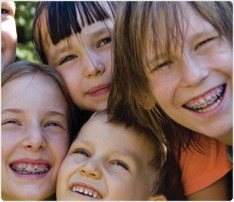 Orthodontic treatment gives your child a great start in life. It provides them with an attractive smile, which is a wonderful asset they will have for the rest of their lives. This will boost their self confidence and esteem and this can benefit both social and career success as well as improve a persons general attitude toward life. When should your child have their orthodontic assessment? The ideal age for your child to have their orthodontic assessment is 8 years of age. Initial orthodontic assessment at this age allows your orthodontist to plan treatment to start at the optimal stage of their growth and development. Avoiding the extraction of permanent teeth. A balanced facial profile with optimal support for the lips which will support long-term facial appearance. A beautiful full, broad smile. What is the ideal age for Orthodontic Treatment? Children with prominent teeth which are prone to damage by accidents such as tripping or falling off a bicycle and should be corrected as early as possible. Often prominent teeth are associated with slow development of the lower jaw. A special “functional” brace or “growth accelerating” brace may be recommended to encourage growth of the lower jaw. Narrow smiles should be corrected as early as possible to prevent the development of “crossbites”. Failure to do so can result in the lower jaw developing unevenly and the chin growing to one side. Thumb sucking habits cause prominence of the front teeth and a narrow smile. 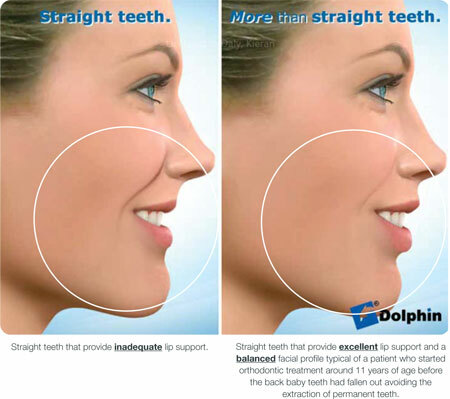 This should be discouraged and if necessary an orthodontist can fit an anti thumb sucking appliance to discourage the habit and correct the narrow smile. Younger children like wearing braces and particularly while they are still at primary school they are under significantly less social and peer pressures. Teeth move easily and more effectively while they are growing into the mouth. 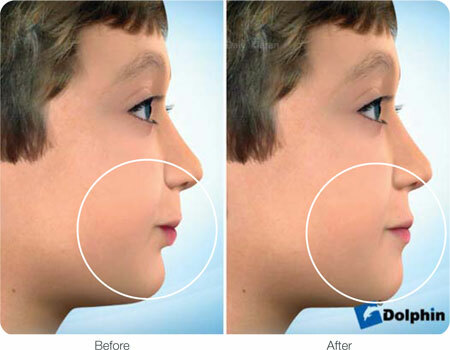 Correction of jaw growth. Often, prominent front teeth are associated with a lower jaw that is too small. A ‘functional’ or ‘growth accelerating brace’ should be fitted when a child is still growing and it can encourage forward growth of the lower jaw. Avoiding the extraction of permanent teeth. Certain baby teeth are bigger than their permanent teeth. If this extra space can be captured by fitting a “space maintainer” before the baby teeth have fallen out, then crowding can be corrected without extracting permanent teeth. This creates a full broad smile with better lip support and a nicer facial profile.